We are excited to announce the ‘Banjo Seven’ event at Eagle Music, taking place at the North Light Gallery, Huddersfield, on Saturday 26 October 2013 with special guests Greg, Janet & Jamie Deering and world class performances from the Kruger Brothers, Down County Boys, Kentucky Cow Tippers, Old Grey Dogs, and much more throughout the day. This will be the Magnificent Seventh event at Eagle Music with Deering Banjos, following our hugely successful 2007, 2008, 2009, 2010 Banjo ‘1000’, Banjo ‘5’ 2011, and Banjo ‘2012’ showcase events here at Eagle Music Shop. This year we are most proud to be celebrating our Magnificent Seventh consecutive year as the world’s number one dealership for the USA Deering Banjo Company. Please join us at our 'Banjo Seven' event, where you will have the opportunity to personally meet seven of the USA’s greatest icons in the banjo and American music world: The Magnificent Seven… Greg Deering, Janet Deering, Jamie Deering, Jens Kruger (banjo), Uwe Kruger (guitar), Joel Landsberg (bass), and Josh Day (percussion). We are looking forward to another fantastic day of music, jam sessions, on-stage afternoon workshops, and an on-stage evening concert performance from the world renowned Kruger Brothers, supported by the Down County Boys. Also an opportunity to browse what will be probably be the largest selection of banjos ever to be displayed for public viewing in the world! More details - and photos of those who will be taking part - can be seen here. We are very happy and proud to announce that our first album, Lowering the tone, is finally ready! It was recorded over a couple of days in Newtownabbey earlier this year and is a mix of our own material alongside some classic bluegrass. You'll be able to get it at any of our upcoming gigs, and we'll post details of where you can order it online shortly. We're excited for everyone to hear it and hope you enjoy it. The Down and Outs, probably the hardest-working bluegrass band in Ireland at present, are beginning to make their mark outside the island as well. Their many fans and friends heard recently with great regret that Howard Walker (banjo) had suffered a bad injury to his right wrist. It is hoped that he will be fit for their scheduled appearance at the 22nd Appalachian and Bluegrass Music Festival in Omagh (31 Aug.-2 Sept.). Meanwhile, the Down and Outs are grateful to have Tony Curran of Templepatrick lending his talents on banjo. Following closely upon yesterday's news about 'My window faces the south', Lilly Drumeva reports from Bulgaria that her band Lilly of the West has released a further live music video, also recently recorded in live performance at 'Music Division', the number one music shop in Sofia. The new video is 'Walkin' after midnight'. As with 'My window faces the south', Lilly of the West performed this number with electrical instruments, giving a more country music feel. The band featured Michael Sishkov (pedal steel), Yasen Vasiliev (lead electric guitar), Svoboda Bozduganova (stick bass), Ludmil Stoynev (fiddle, with electric pickup), Paul Malini (drums), and Lilly Drumeva (vocals, acoustic guitar). Lilly Drumeva invites everyone to enjoy the new live video recording of 'My window faces the south' on YouTube by her band Lilly of the West. 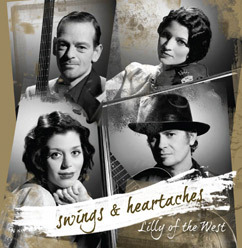 Lilly of the West recorded this Bob Wills classic live in May 2013 at 'music division' in Sofia, Bulgaria, with full western swing instrumentation of fiddle, electric lead guitar and steel guitar, rhythm guitar, upright bass, and percussion. 'My window faces the south' was also one of the tracks on LOTW's 2012 album Swings & heartaches, which is available on cdbaby or direct from Lilly's website. To hear more of their music, or to book the band, contact Lilly through the website or by e-mail. The Watery Hill Boys trio from Drogheda in eastern Ireland have recently completed work on their second album (scheduled for release in September 2013), and will be touring on the Continent in the first half of 15 August. This is their third consecutive year of playing on the Continent, and they will perform at the prestigious La Roche Bluegrass Festival in La Roche-sur-Foron, Haute Savoie, France - having been selected to take part in the European Band of the Year Competition on the main stage on Sunday 4 August. The following day they head south to Catalonia to play five dates at venues including the famous Harlem Jazz Club in Barcelona and the Sunset Jazz Club in Girona. They will also be paying a return visit to the village squares of Rupiá and La Pera, in the region of l’Empordá, with a final concert night on the beach near Sant Pere Pescador. This follows a busy July in Ireland: the Boys have appeared in the last few weeks at the Athy Bluegrass Festival in Co. Kildare, at the Ardara Bluegrass Weekend in Co. Donegal, and at the Ulster Scots Folk Festival in Cairncastle, Co. Antrim. The tour schedule is on their Facebook page. On their return in mid-August, the Boys will set about launching their album before heading to the Moniaive Michaelmas Bluegrass Festival near Dumfries in Scotland on 27 September. The new album is titled Somebody’s been usin’ that thing, taken from the Callahan Brothers recording (1936). The music falls firmly into the old-time and early bluegrass idioms, where the Watery Hill Boys have built up a reputation of excellent musicianship, harmony singing, and inventive arrangements of traditional and original material. Our brand new album Flor de canciones is out now. Our brand of bluegrass/traditional Spanish is available on CD, and in coming weeks on vinyl LP. Mandolin fans may like this track. Bluegrass fans may like this track with Lluís Gómez. Or this other track with Holly Odell (fiddle). Honky-tonkers may like the steel guitar on this traditional ancient Castillian song. The Maiden City Festival in Londonderry/Derry city, Northern Ireland, has included a day devoted to bluegrass and old-time music since the year 2000 - when the Blue Grass Boogiemen (NL) were at the top of the bill. In the last few years this has extended to a second day, and the number of bands and musicians involved has increased. The programme for this year's Maiden City bluegrass, old-time, and folk events (3-4 Aug. 2013) is shown on the poster above. Click on the image for an enlarged view. Oliver Waitze of the New Acoustic Gallery (NAG) wishes everyone a wonderful holiday - the NAG will be on holiday from 31 July to 12 August - and sends his July newsletter with details of new products, concerts, and workshops. Coming: Nechville Classic DLX Custom Gold engraved! 10 jähriges NAG Jubliläumskonzert: Mike Marshall & Darol Anger am 27.10.2013 - nur noch 5 freie Tickets!!!! "I know the Irish and international bluegrass community was shocked by the untimely death of Hard Station’s Vinny Baker last week. Originally scheduled to debut at the 19th International Bluegrass Festival in Dunmore East, Ireland, the band has decided to go ahead and perform at the Festival – it was a tough decision to make, but as colleague Johnny Gleeson said himself – it’s what Vinny would have wanted." Hard Station, the Midlands (IRL) based bluegrass and new grass band will make their Waterford debut at the 19th Guinness International Bluegrass Festival in Dunmore East. The decision to perform was a heartfelt one for band members Johnny Gleeson, Joe Meehan and Roy Brennan, following the untimely death of founding member Vinny Baker who died last week. An exceptionally talented musician, Vinny skillfully mastered many instruments and was involved in a number of renowned bluegrass bands including The Tennessee Breakdown Band and Bending the Strings before founding Hard Station six months ago with a group of like-minded and talented musicians. Johnny Gleeson who played with Vinny for many years said the decision to perform at the 19th Guinness International Bluegrass Festival was a difficult one, but one that Vinny would have wanted. “He was so proud of how far Hard Station had come in the last six months. He loved the music we made and we know he would have been to first to say to us ‘the show must go on’”. Lovers of bluegrass and new grass can look forward to a wide assortment of bluegrass fiddle tunes, new grass, swing, jazz, gypsy jazz and plenty of acoustic music with Johnny Gleeson on dobro, guitar and vocals, Joe Meehan on mandolin, guitar and vocals and Roy Brennan on double bass and vocals. Mick Daly, Festival Founder and Organiser, is happy that a band of Hard Station’s calibre will be debuting at the Co. Waterford festival from August 22nd to 25th. “Vinny was such a huge influence on the Irish bluegrass and new grass landscape and the whole community is shocked and saddened. His loss is felt deeply by musicians and music lovers alike who respected his astonishing talent, desire and energy that went into making great music,” he added. The 19th Dunmore East Bluegrass Festival commences at 7pm on Thursday, August 22nd at the Strand Hotel and features three days of dozens of bands, playing almost 50 gigs in throughout the Co. Waterford coastal village. For more information about the 19th Guinness International Dunmore East Bluegrass Festival in Co. Waterford visit www.discoverdunmore.com. Chris Jones & the Night Drivers (USA), frequent visitors to Europe, are releasing today (23 July) a new single — the title track of their forthcoming Rebel Records release, Lonely comes easy. Chris first recorded it on his country-flavored album Too far down the road (2006), and the band has now re-recorded it in a bluegrass vein, with IBMA Momentum Award Vocalist of the Year Emily Bankester joining Mark Stoffel on harmonies. It is available at iTunes, Amazon, and other online music stores. The album Lonely comes easy, largely composed of original material, is scheduled for release on 27 August. The full text of the present press release, including an audio link to the single, can be seen online. The unique 'rockgrass' band Hayseed Dixie (USA) will be playing a large number of shows in Europe during the rest of 2013. This coming Sunday (21 July) they will be at the Colours of Ostrava Festival in Ostrava (CZ); on 31 August they are scheduled to play the Harvest Music Festival at Greyabbey, Co. Down, Northern Ireland; and during the following month they will be in Faak Am See, Austria, for European Bike Week (Fri. 6 Sept.) and at the Schouwburg in Kortrijk, Belgium (Friday 20 Sept.). On 2 Nov. they begin a four-week tour, the 'Complete AC/DC Album plus Requests Tour', mostly in Britain but ending with three dates in Denmark. Full details are on the band's appearances schedule. The above image shows the cover of their 2012 album Nicotine and alcohol, available in download form from Amazon and iTunes, and as a CD only from the band's website. The eleven songs include three in German and one in Spanish. Jam-spaghetti...! Do not miss it! While waiting the end of August and our Big Jam Festival (several great concerts on 30-31 August in Mazy), come on 26 July with your instruments to share a musical and friendly dinner with us! Reservations are needed for the spaghetti dinner - please contact by e-mail or by calling 0472 22 03 26. The payment of €10 will confirm your reservation. The entrance of €2 is then included! For those who will only jam, no booking needed! See you! Goal: to offer a friendly meeting place for fans of bluegrass, Irish, old-time music and more globally, for fans of acoustic music who wish to share musical moments between players or listeners. When: these musical meetings are scheduled to the last Friday of each month. So the next jam will happen on Friday 26 July 2013. Where: at the wonderful Zy’coop place, 9a rue de l’usine, 5032 Mazy. Who: fans of bluegrass, Irish, and old-time acoustic music, with their instrument or not, beginners or advanced… cheerfulness required! Rate: Take part to the jam for a symbolic coin of €2!!! Thanks to all volunteers for their help. Toogaroo, the latest CD by the German band Covered Grass, has been reviewed by John Goad on Bluegrass Today. The thirteen tracks are all original compositions, and the album can be downloaded from iTunes and Amazon. Covered Grass consists of Corina Aurin (lead vocals, mandolin), Volker Fisher (banjo, dobro, vocals), Felix Eichert (guitar), Joon Laukamp (fiddle, mandolin, vocals), and Carsten Manz (bass). The band appeared at last September's Appalachian & Bluegrass Music Festival at the Ulster American Folk Park in Northern Ireland, before going to the USA to take part in a 40th anniversary cast reunion and celebration of the TV series 'The Waltons'. They had been invited to the reunion on the strength of their song 'Goodnight John Boy', which is one of the tracks on Toogaroo. Fans of bluegrass, honky-tonk, blues, country, rhythm ‘n’ roots are in for a musical treat as the Guinness International Bluegrass Festival returns to the south-east this summer. Now in its nineteenth year, the festival takes place in Dunmore East, the picturesque Co. Waterford seaside village, from 22 August to 25 August, and the festival organisers are delighted to announce headline act Mary Jean Lewis and the Low Men. Mary Jean Lewis grew up in a family of musical royalty. Her mother Linda Gail Lewis has recorded more than twenty albums, and her uncle, Jerry Lee Lewis, an early pioneer of rock and roll, shot to fame with 'Great balls of fire' in 1957. Mary Jean Lewis, an established singer/songwriter, hails from Louisiana, but now resides in Scotland. Drawing on a wide range of country, blues, and rock ‘n’ roll, her powerful voice and soulful lyrics are testament to her remarkable musical legacy. The festival will also feature the return of Land’s End, who debuted at the festival in 2012. The band, made up of members from Cork, Galway, Dublin, Munich, Liverpool, and Canada, perform music strongly embedded in the bluegrass tradition, but each member brings a distinctive sound of their own musical tradition to the musical arrangements of the band. Dublin-based four-piece Well Enough Alone, who appeared in 2011, are back to deliver a mix of original bluegrass songs to classics to hot instrumentals. Tin Box Company, the Pilgrims, and the Down and Out Bluegrass Band are just some of the other names on the lineup for the country’s favourite bluegrass festival. More exciting names are to be confirmed over the coming weeks. 'The lineup is top-quality and the three-day festival will see some wonderfully talented musicians performing throughout the village. There is also a wide-reaching appeal to the acts, playing an eclectic mix of bluegrass, country, swing, blues, rhythm and rock ‘n’ roll. So you don’t have to be a bluegrass fan to enjoy the festival, you just have to like good music', Mick added. The 19th Dunmore East Bluegrass Festival kicks off at 7.00 p.m. on Thursday 22 August at the Strand Hotel and heralds the start of three days of dozens of bands, playing almost fifty gigs in the village's pubs, restaurants, and hotels. Enrolment is now under way for the next La Fuente music camp in Andalucia, featuring Alice Gerrard and Beverly Smith as teachers. This is the third time that Alice and Beverly have worked as a team at La Fuente, and their week has been fantastic. Daily sessions will be offered in fiddle, banjo, guitar, individual and group singing, and other topics that may prove to be of interest. Cost for participation is £550, which covers everything except travel to and from the site. For further information, visit Kate Lissauer's website and go to the events page and the gallery, and contact Kate through that website or via e-mail. Here is a report from the first country and bluegrass festival which we organised last weekend. It was a lot of work but went really well, and we hope it will become a tradition. Have a nice summer and see you at the festival! The EBMA is considering translating 'Y'all come any time now, y'hear?' into all European languages. Meanwhile, it is good to know that IBMA membership has increased by 18% since May. The latest issue of AirPlay Direct's online magazine The Direct Buzz includes an in-depth interview with IBMA executive director Nancy Cardwell, and another with the members of Della Mae (USA), who took part in Rainer Zellner's 2011 Bluegrass Jamboree! tour. Zine Records have taken over the running of the Guildtown Bluegrass Music Festival in Scotland, which will be held this year on 19-21 July, with Red Wine (I) at the top of the bill. Further details of the lineup are on the poster image above (click for an enlarged view), and a full programme schedule and ticketing details are at the original Scottish Bluegrass Association website. 18 July: Alter Bahnhof, Trittau, Germany, 8.00 p.m.
19 July: Irish Pub, Parchim, Germany, 8.00 p.m.
20 July: Konzertgarten, Schorfheide, Germany, 8.00 p.m.
28 Aug.: Kump, Brilon, Germany, 8.00 p.m. Thanks to Michael Pugh, banjo player and US resident in the Munich area, who announces the official launch of Bluegrass Camp Germany. Its first three-day meeting is scheduled to be held on 11-13 April 2014 at Fischbachau, Bavaria, southern Germany. Michael is associated in this project with Rüdiger Helbig, who has been regarded as Germany's most renowned 5-string banjo player for over thirty years. Rüdiger and his wife Heidi are the owners of the Folk Laden music store in Munich, 'Germany's Finest Acoustic & Vintage Instrument Center'. In addition to Rüdiger, the Camp's scheduled 5-string-banjo teachers include Greg Cahill (USA), Tom Hanway (USA), and Tom Bodenmann (CH). Other faculty members will include Clay Jones (USA), flatpicking guitar; Philipp Schoppe (D), mandolin; Phil Leadbetter (USA), dobro; and Heidi Helbig (D), vocal and harmony. Fiddle instruction is also planned. Rüdiger Helbig will also give instruction on banjo setup, and his band Huckleberry Five will give band workshops. All faculty members will be involved in jamming and instruction in 'survival techniques'. Students of all playing levels are welcome to register. The Bluegrass Camp Germany website is at present under construction; the Camp is also on Facebook. Bavaria is now well provided with bluegrass instruction, as the established Bluegrass Camp Munich is scheduled to be held next on 4-7 October 2013.